Like having a great time, is not hard to find the best hostels in Costa Rica – but, as always, we’ll help you! Costa Rica has some of the Most Awesome Hostels In Central America so here we gathered some of the best of the best. Love partying by the beach? Costa Rica, with its amazing party hostels, is your perfect match! We challenge you not to fell in love with this hostel! La Oveja Negra sums up everything that a hostel by the beach must have: amazing vibes, great common areas, a restaurant and bar that lights up at night time and a pool for when the ocean is too salty for you. This hostel is just like Costa Rica: a perfect balance between chill and party. Located right by the beach, Playa 506 offers you many areas to relax at day time and a sociable and fun bar (sometimes with DJ’s!) at night time. So picture yourself in one of those hammocks and book your bed! Hammocks, sofas, picnic tables, sun loungers… the offer of places to relax at Costa Rica Backpackers is broad, so is the offer of amazing people! This is the place to be if you want to meet other travellers and have a great time by the pool or over a beer. The name says it all: this is a proper resort made for backpackers! With an amazing swimming pool surrounded by trees, tents with wooden floors and the usual dorms for those backpackers that love a cheap bunkbed, Arenal Backpackers Resort is a sociable retreat. Address: 350 meters west of central park, towards volcano. This is the hostel for the laidback backpacker that likes to be close to nature. The pool and common areas are great to meet other travellers and Monkey, the dog, is there to hug you if you are experiencing one of those homesick days! In Monteverde… stay in a verde (green, in Spanish) hostel! Bad joke apart, Cabinas El Pueblo is a great place to relax surrounded by refreshing nature. And, don’t worry, the friendly and smiley staff will help you to book all tours around the city. Look at that view in the picture… do I need to say anything else? Camino Verde is the choice for backpackers who love to seize the day and enjoy an open and wide view now and then. The rustic style and friendly atmosphere will turn this hostel into a home away from home. A few meters from the beach, Hostel Dos Monos South is a well-equipped hostel with surf vibes for all kinds of backpackers. Its wooden beds are comfortable, and the rooms have AC. Don’t dare to leave the place without doing a surf lesson! A surfer’s nest that welcomes everyone with an open mind, Wavetrotter is a relaxed hostel where hammocks are spread everywhere. When staying there, keep an eye on the trees around, you might see some lovely monkeys! In need of a fancier night? Capital Hostel de Ciudad is a very well put together and pretty hostel to make your stay in San Jose stress free. But don’t be fooled by the elegant vibes, the place is still pretty sociable, specially the entertainment area that has a pool table, musical instruments, vinyl player and board games. Tired of the busy streets of San Jose? Fauna Luxury is a retreat for backpackers from all around the world that gather around the beautiful hostel pool. During your stay, you can have some “me time” practicing yoga and then socialize making new friends by the pool table – best of both worlds. Want to swing your problems away? This lovely hostel has rope swings in the common area, a place to rang out and meet other travellers – all that located just a few steps from the sand and the blue ocean… Do I need to say anything else? This family run hostel is located only a 5 min walking from the beach and has a beautiful swimming pool where you can meet other travellers. What else can a backpacker ask for? Oh! They offer aerial yoga classes if you need the stretch! Did I hear taco bar?? Yes! Hostel Plinio has a taco bar, a pool, great atmosphere, many commons areas and a friendly staff – all that for fair prices! Swing in a hammock and talk to travellers from all around the world that any problems you might have will feel very far away. Yoga with a great view is one of the trademarks of Selina Hostels all around Latin America – and here you can experience that! Well organized, huge and beautiful, this hostel is the perfect pick for travellers wishing some fancy, relaxed days. Have you ever stayed in a hostel where the walls were made out of bamboo? This is your chance to cross that out of your bucket list! Come relax at Roots Family and enjoy the best of Puerto Viejo along with other travellers you will meet at the common area. Colours and more colours around wooden furniture make this place a laidback retreat. With a 5 min walk you reach a beautiful beach and you can rent a bicycle to explore the surroundings. Not close from the city centre, is prefect for those looking for calm stay. 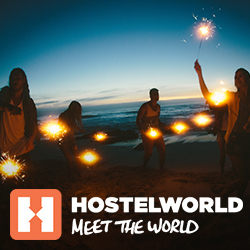 The post The 17 Best Hostels In Costa Rica appeared first on Hostelworld Blog.